Tar spot of maple in northeastern North America is caused by three species of the fungus Rhytisma: R. acerinum, R. punctatum and R. americanum. 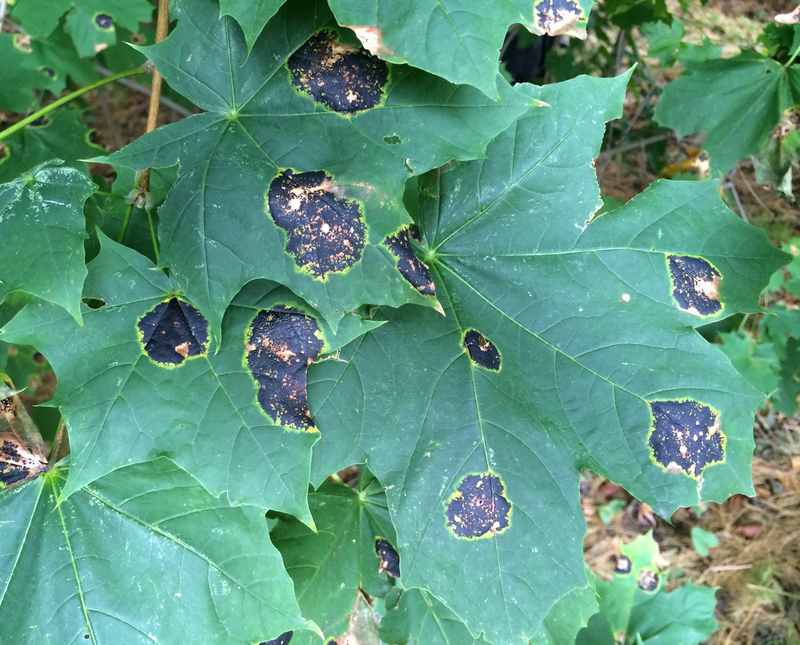 Tar spot of Norway maple (A. platanoides) is caused by R. acerinum, which like its host is also non-native. The most commonly diseased native maples are silver (A. saccharinum) and red (A. rubrum), which are infected by R. punctatum and R. americanaum. These latter two Rhytisma species are both native to North America. Symptoms of tar spot first appear after leaves have attained full size (late May to early June) and appear as rounded, pale green, chlorotic spots with tiny fruiting structures developing in the center. These small, individual fruiting structures continue to develop over the summer and coalesce to form large black-colored spots by late summer (typically in August). 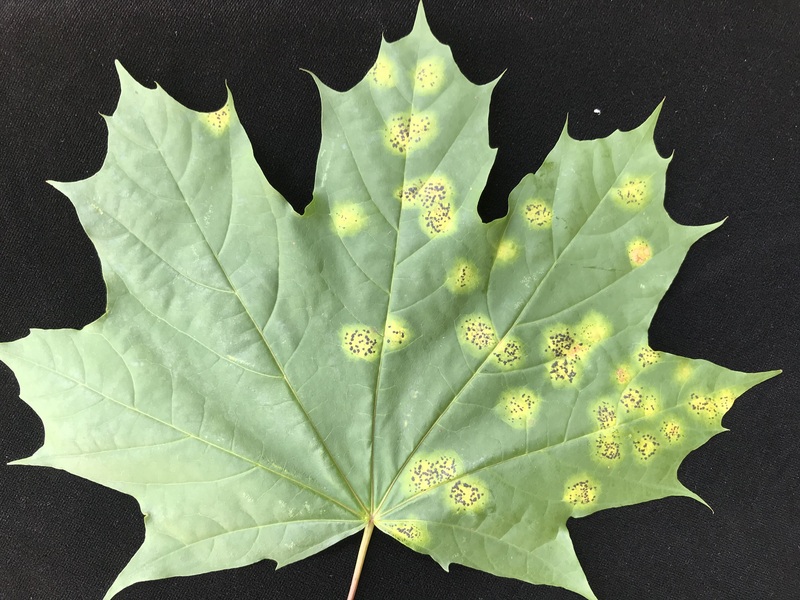 On Norway maple, the spots are often very large and conspicuous and the disease is frequently referred to as “giant tar spot”. On silver and red maple, occasionally on sugar maple, the spots are usually much smaller but at times can be large. When trees are heavily infected, premature leaf shedding can occur. However, early leaf drop due to the disease is most common in heavily shaded settings with minimal air flow or when numerous Norway maples are pesent at a site. In the spring, the fungus sporulates on discarded leaves from the previous year. The black-colored fruiting structures mature, split open, and forcibly eject spores that disperse on local air currents to infect the current season’s foliage. 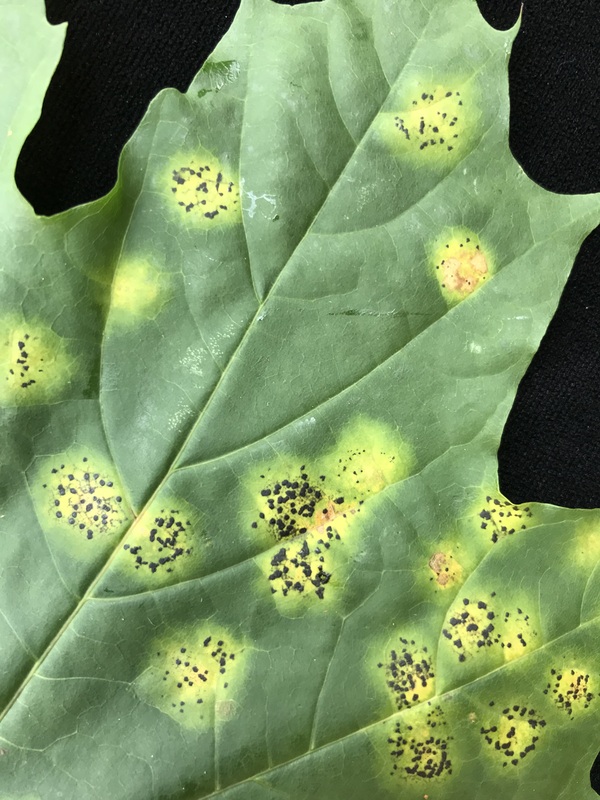 Free moisture on the leaf surface is required for spore germination and infection, and as a result, disease outbreaks are more severe during years with abundant rainfall in May and June. The fungus grows within the leaf for several weeks before the pale-colored leaf spots appear. As summer progresses, black fruiting structures develop over and within the chlorotic spots. When leaves are shed from the canopy they tend to land with the fruiting structures facing up, allowing for effective spore release the following spring. 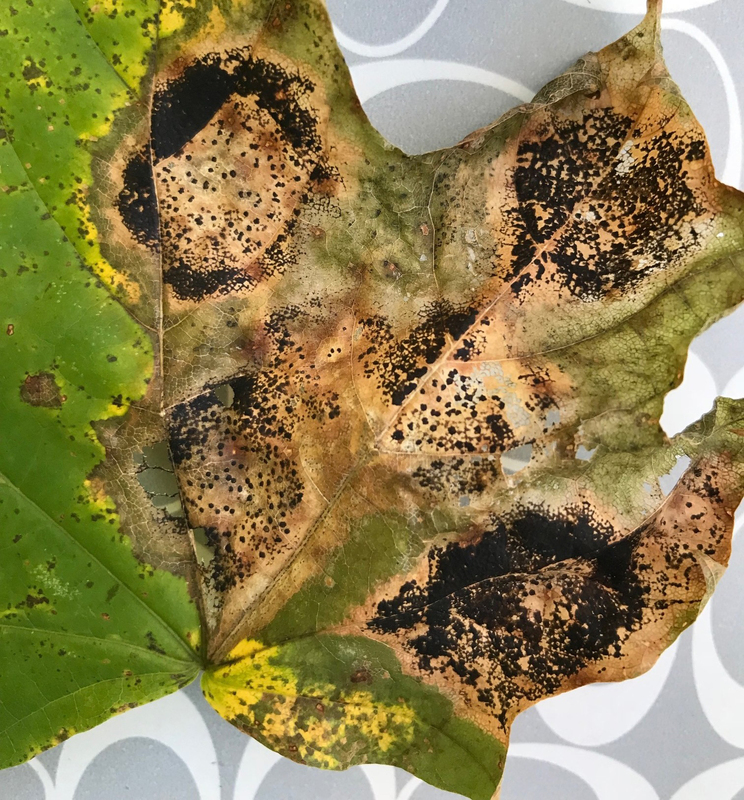 Research and observations have found that when outbreaks of tar spot on Norway maple are severe, a serious outbreak is not guaranteed for the following year. When trees prematurely shed their foliage, it is usually late in the growing season and results in only minor to moderate growth losses. Tar spot is not a fatal disease by itself on landscape or forest trees. The best course of action is to collect and remove discarded foliage, which harbors the fungus and allows it persist at the site. If left, Rhytisma will sporulate the following year, initiating another disease cycle on the current season’s foliage. Fungicide application is not recommended for this disease.